In Jan. 2015, Michael Dickson tagged along with a friend to a punting camp in Sydney, Australia. Less than four years later, the Seahawks rookie's improbable rise has landed him in a competition for a roster spot. Michael Dickson punted his first American football in January 2015. Less than eight months later, he started for the Texas Longhorns in a nationally televised game inside Notre Dame Stadium. And that’s not even the improbable part. Consider, first, that Nathan Chapman — the head punting coach for “Prokick Australia,” a program that trains prospective punters for the college and NFL levels — organized an assessment camp in Sydney, Australia, in part to scout Oscar Bradburn, the current Virginia Tech punter. Not Bradburn’s childhood friend, Dickson. “They knew each other and played with each other and Michael just sort of came along,” Chapman said in a phone interview from Melbourne last week. “The first thing we thought was, ‘Hey, listen, this kid’s really strong. He’s got a really strong leg.’ It was certainly something that we knew we could work with, and be able to place him in a college. Dickson, who had previously played soccer and Australian rules football — a sport that requires players to score points by kicking an oval-shaped ball between goal posts — moved roughly 550 miles southwest from Sydney to Melbourne in Victoria, beginning his training in March 2015. In June, another punter who had accepted a scholarship at the University of Texas could not be admitted academically. The Longhorns needed a suitable substitute. What they got was Michael Dickson. “Michael was easily our next best guy,” said Chapman, who added that punters typically train with Prokick Australia for a full year before receiving college consideration. So Dickson took an official visit to Austin, received a scholarship offer from Texas, and voila: on Sept. 5, he was the starting punter for one of the country’s most beloved programs, in a nationally televised debut on the road — at Notre Dame. Never mind that most of the rules remained a mystery. 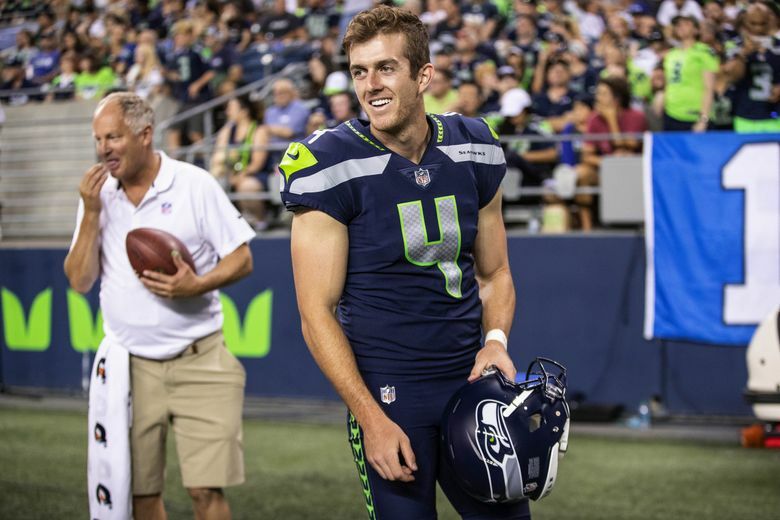 “I never really watched a full game of American football until I played my first game against Notre Dame,” said Dickson, now a rookie with the Seahawks. “I had 10 punts my first game. Still, in the first American football game of his life, in front of 80,795 people (and millions more at home), Dickson punted 10 times for a 42.3-yard average, with a long of 56 yards and a pair of punts inside the 10. In his true freshman season in 2015, he averaged 41.3 yards per punt, earning honorable mention All-Big 12 honors. In both 2016 and 2017, Dickson was named Big 12 Special Teams Player of the Year. He added a Ray Guy Award — presented to the premier punter in college football — last winter. All because he tagged along to a punting camp with a childhood friend. All because a scholarship unexpectedly became available. All because he had the courage to pursue an improbable dream. “Michael is really good in the sense that he trusts his leg and he knows where he wants to put the ball and he goes about his business,” said Chapman, who played eight years of professional Australian rules football before making a brief appearance with the Green Bay Packers. “So I think it’s his mental strength and determination. In other words, plenty of punters have strong legs. But how many inevitably crumble in front of a crowd? “I’ve never really had trouble with a big crowd,” said Dickson, who averaged 47.4 yards a punt last season, equaling his school record from the year before. “I’m so focused on my job that I don’t even know the difference between a 100,000-person crowd and a 30,000 crowd. That was apparent in the 2017 Texas Bowl, when Dickson put on one of the premier punting displays in college football history. In a 33-16 victory over Missouri, the 6-foot-2, 208-pound junior uncorked 11 punts, 10 of which landed inside the Tigers’ 20. Missouri started drives on its own 3, 9, 12, 10, 7, 3 (again), 2 and 4-yard-lines. If Dickson were an artist, and punts were his paint, then this was surely his masterpiece. “I’ve never seen (a punter) affect the game the way he did tonight,” Texas coach Tom Herman said at the postgame news conference. In a game that featured three UT offensive touchdowns, a safety and a 38-yard fumble return for a score, Dickson was named the Texas Bowl MVP. It was the first time a punter earned this postgame honor since Florida State’s Graham Gano in the 2008 Champs Sports Bowl. Dickson will continue to do his thing in Seattle, after the Seahawks took the junior punter with the 149th overall choice in the fifth round of the 2018 NFL draft. The Sydney native joins Lachlan Edwards (New York Jets), Jordan Berry (Steelers) and Cameron Johnston (Eagles) as Australian punters on NFL rosters. Of course, he’ll have to beat out 13th-year pro Jon Ryan to stay there. And performances like the one last Thursday certainly will help. 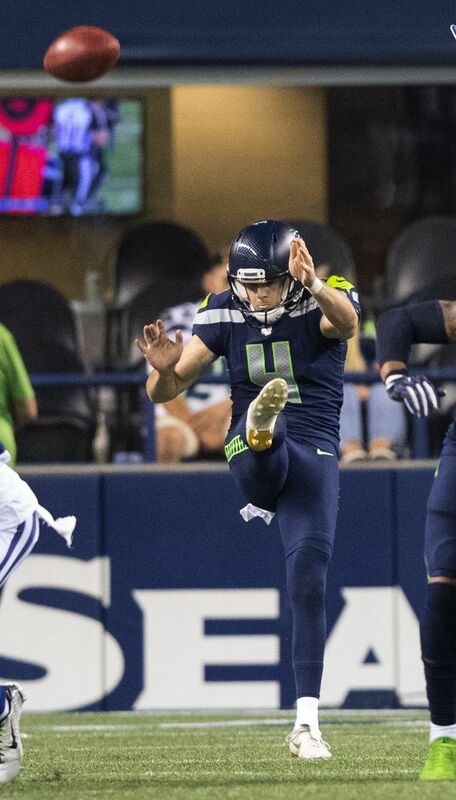 In the Seahawks’ preseason-opening defeat against Indianapolis, Dickson averaged 50 yards with three punts, the highlight being a booming 59-yarder from the shadow of his own end zone. The 22-year-old’s journey certainly has been improbable. But from Sydney, to Austin, to Seattle, his approach has never changed.